Den of Thieves is a decent film that has some exciting moments but leaves spaces that can make things mildly confusing from time to time. Los Angeles - The City of Angels..or is it? Statistics show it has one of the highest number of bank robberies in the country. With an average of one per hour, it seems like a haven for those looking to make a lot of cash fast. It is only right then that a movie about a bunch of bank robbers would be set there. Den of Thieves, 2018 Universal Studios feature, looks into one gang of bank robbers and the rogue law enforcement agents set out to catch them. Available on 4K, Blu-ray, DVD and digital download, it is a drama full of suspense and interesting character. Ray Merrimen (Pablo Scheiber; Orange is the New Black) is a planning genius and a mastermind ex-military thief. He is working with a group of men he has known since his military days and they recruit Donnie (O'Shea Jackson, Jr.; Straight Outta Compton) as he is known to be a skilled driver. This group of bandits have highly choreographed and technical heists planned down to the minute with no room for errors. Merrimen has decided their next heist - to Rob the Federal reserve Building which has the most sophisticated and elaborate security system known. "Big NIck" O'Brien (Gerard Butler; Olympus Has Fallen) is a Detective on the L.A. Police force. He has a drinking and fidelity problem and can't seem to figure out how to balance his work and personal life. Complicating matters is his obsession to bring down Merrimen and his gang. He leans on Donnie who only gives him minimal details, and on the day of the heist he realizes the LAPD have been duped. However, he manages to catch up to Merrimen and kills him. When he inspects the truck all he finds is shredded bills and realizes he was duped. While Den of Thieves is not an original idea it does have a few things going for it. For starters, the ending has an unexpected twist which one doesn't see coming. The movie also has a decent cast led by Butler. Curtis "50 Cent" Jackson (Get Rich or Die Tryin') once again proves he has some versatility pairing acting with his music career. O'Shea Jackson, Jr. once again turns in a solid performance creating a career that will no doubt carry him forward. Schieber offers an intensity that is only matched by Butler's insanity. The Blu-ray is presented in 1080p high definition video, which showcases the various settings. Colors are deep and true even though the overall feel of the film is gritty and a little bit dirty. The DTS-HD master audio 5.1 offers a surround sound experience that immerses the viewer completely from the dialogue to the gunshots. The combo pack offers two versions of the film: Theatrical and Unrated, the latter offering 8 more minutes of action and drama. There are also eight extras including an alternate ending, Alpha Males, Into the Den, Alameda Corridor, Outtakes, Theatrical Version Audio Commentary, Theatrical Trailer #1 and Theatrical Trailer #2. As mentioned, Den of Thieves isn't a new concept and there have been other films that have done it better. The logistics behind the heist are interesting but there seems to be some confusion as to the backstories of many of the characters leaving holes in their development. O'Brien, however, is an intense, multilayered and flawed character and is a welcome change of pace for Butler. He makes the film more interesting and the intense scenes between him and Schreiber offer breathe holding suspense. Den of Thieves is a decent film that has some exciting moments but leaves spaces that can make things mildly confusing from time to time. However, it seems there will be more to come as STX entertainment has already announced a sequel is in the works. 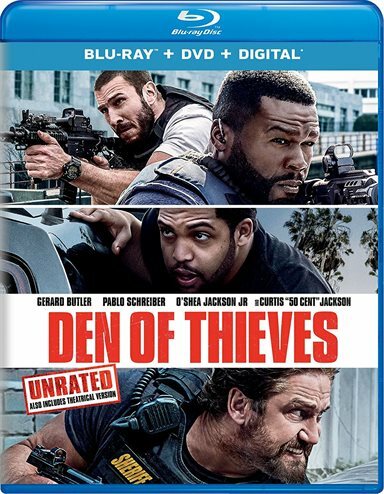 Download Den of Thieves from the iTunes Store in Digial HD. For more information about Den of Thieves visit the FlickDirect Movie Database.